Our Client is a leading online payment systems provider of end-to-end cash and digital payment solutions. One of the duties they perform is cash encashment into the ATM’s. The encashment officers are provided with certain amount and they are assigned to deposit the cash in multiple ATM’s in the region. On successful deposition of amounts into ATM, cash deposition slip is generated by the ‘Automated Teller Machine – ATM’. These receipts generated through ATM are to be received and submitted by the officers for maintaining the transaction data of how much money was deposited at each ATM. These receipts are crucial since they serve as proofs in case of any discrepancies in the cash flow and they can be used as supporting documents for transactions that are to be reverted due to any technical issue. Since the person with receipt must travel back to office and then record the entries, lot of time was wasted. Moreover, the management and tracking of denominations, officers, amount deposited, amount left became tedious. Client decided to have a mobile application that could help them capture and upload data on the go. The indents that states the total amount and denominations of cash are uploaded into our application. After uploading the indents, trips are generated and assigned to the encashment officers. Depending upon the trips assigned, the officers carry out cash encashment in the ATM’s for the region. Our customized mobile application helped the officers to capture the receipts generated on the spot. The officers would make data entry for the receipts on the go. The detailed information of denominations for ATM counter/audit role, Physical cash counter and switch counter was made by the officer through the mobile application. Once the data is filled, the same is uploaded into the client’s server. 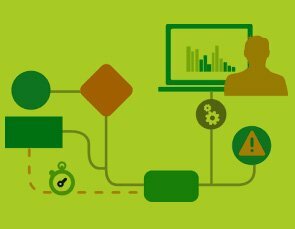 The real time access to data uploaded at the server helped the client to stay up to date with the data. The discrepancies in case if any were managed through CBR Rectification module in our web application hosted at client server. 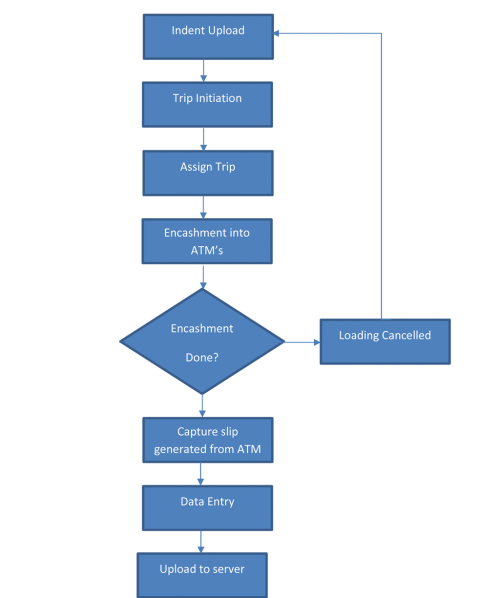 Flow Diagram for Cash Encashment Process Flow- Mobile Application.